Going on a trip? Cringing on the thought of leaving your bidet at home? Toilet paper is not for everyone! Regular bidet users find it quite unsatisfactory to use toilet paper after they have started using bidets. This is why they always find themselves in a bind each time they use a public restroom. 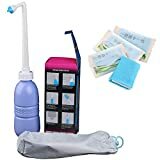 How to Use a Portable Bidet? 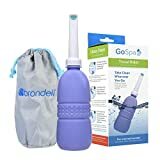 A travel bidet or a portable bidet is actually a small water bottle that comes with an extended nozzle that allows you to spray yourself for better cleaning. These are often small and compact which allows users to travel with them. They can easily fit inside bags, glove compartments, and suitcases. For regular bidet users, it can be quite hard to use toilet paper when traveling or using someone else’s bathroom. The condition gets only worse for folks that suffer some sort of ailment such as hemorrhoids, itch, UTIs etc. These folks want a gentler wash and toilet paper can often end up irritating their skins even more. Unscrew the top cap of the bottle. Fill it completely to the top. While filling keep your finger on the bottom air valve. Retract the nozzle from the cap and screw it back on. Place the nozzle into the appropriate position. Remove your finger from the air valve. Start squeezing the bottle to spray the water. Adjust the pressure you apply to whatever you find more comfortable. Remove any water left in the bottle. Clean the bottle and wash it with soapy water. When it comes to traveling comfortably, you would probably need a GoSpa Travel Bidet by your spa. It ensures you can get clean even while traveling. 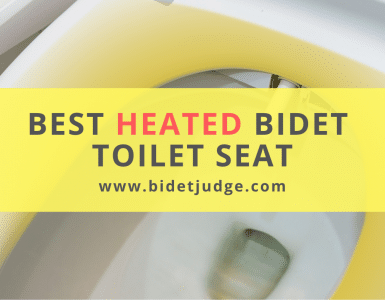 The travel bidet is compact and can easily fit in any bag, suitcase and even the glove box. For easier travel, a discreet carrying bag is included as well so you can carry it anywhere with you. In terms of performance, the GoSpa Travel bidet provides a consistent spray at each press. This is because of the metallic airlock which allows air to enter the bottle. In addition, it allows you to control the pressure of the spray according to your need. The bottle, itself, is quite ergonomic as it is easy to squeeze. The GoSpa is bound to last you for multiple uses because it has a large reservoir, up to 400 ml. Also included is an angled spray design which makes it much easier to clean without getting the bottle dirty. All you need to do is fill the bottle with warm water, screw the cap and simply point and squeeze. You can adjust the pressure and position yourself for a posterior or a feminine wash. Another unique feature is perhaps the easy to store nozzle. You can simply detach it and slip it back into the bottle for better storage. The Brondell GoSpa Travel Bidet is perfect for all occasions when you can’t use a regular one! Its portability, as well as discreetness, is what makes it so popular amongst users. Pressure and position can be adjusted quite easily. Cannot be used by pre-filling it. Strains the hand as it requires you to squeeze multiple times. One of the best travel bidets in the industry, the Palm Handheld Bidet is perfect for using on the go! It easily fits in your bag and in your car. The best part about this bidet is that it has a longer nozzle. The 7.5 inches angled nozzle allows better reach and maximum cleaning efficiency. Furthermore, it makes it very easy to use as well. 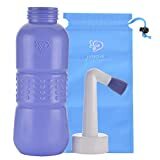 The device is very easy to use as all you have to do is find a source of water fill the bottle and squeeze for maximum cleansing. The bottle is quite ergonomic as it is easy to squeeze. This means that you won’t have to tire yourself out by continuously putting a lot of force. Let’s not forget that the bottle has a large capacity of about 450 ml. However, that’s not all! The Palm is equipped with two sets of five nozzles that allow for more pressure and cover a large amount of area. This means you will be done quickly and would not have to squeeze repeatedly. Moreover, it includes an airlock that allows air to enter the better which makes for much more consistent spraying. You can easily adjust the pressure of the spray by altering your force. Don’t be worried about the large nozzle either. You can easily retract it back into the bottle to make it much more travel-friendly. The carrying case allows you to conveniently and secretly carry the bidet so no one can be the wiser! The large capacity of the bottle. Variety of different nozzles for different pressures. Ergonomic, easy to squeeze bottle. Keeps leaking once you start using it. The bag comes with the logo which defeats the purpose of the discreet carrying bag. If you’re looking for an even cheaper portable travel bidet spray, then perhaps the Hibbent portable Bidet Sprayer will suit your fancy. The bidet is a bottle with a long angled nozzle at the top to allow for efficient cleaning. The bidet bottle is quite easy to fill and can be used with any temperature water. The bottle is quite durable as well. The large capacity of the bottle at 420 ml ensures that you never have to refill it. Furthermore, the bottle is quite ergonomic which makes it easier to squeeze it a couple of times. Say goodbye to batteries and electronics! This is a truly ergonomic solution for your traveling needs. The long angled spray ensures that you get a perfect aim each time you use it. The air valve at the bottom allows you to adjust the pressure of the spray. The value is designed in such a way as to ensure no water leaks from the bottom. Another amazing feat of this travel bidet is that its nozzle can be easily retracted back into the bottle at a simple tap. This means you can easily carry the compact bottle anywhere you go. The bottle is quite easy to set up and to use as well. Being one of the best portable bidets, the Hibbent is perfect for personal cleansing anytime and anywhere. It can help folks suffering from diseases such as hemorrhoids, infections, and itching. The Hibbent water bidet is much gentle than the toilet paper. The compact bottle allows portability. Eco-friendly as It does not require batteries. Long nozzle makes it easier to aim. You have to use the entire bottle every time. It has to be positioned very precisely to ensure it doesn’t leak water. Equipped with a user-friendly design, the Everove Travel Bidet bottle is undoubtedly the best travel bidet for males as well as females. The bidet is quite small in size and is very inexpensive. The device is quite easy to use as well. In fact, even children and the elderly can use it themselves without any hassles. All you need to do is fill it with some water and then aim and spray. The bottle can hold up about 450 ml of water, which is quite sufficient for one time. The air vent in the bottom allows air to enter, however, it does not allow the water to leak it. It also allows you to control the spray pressures. How? It’s quite simple! The harder you squeeze, the more pressurized the stream will be. The bottle comes with a long nozzle as well that can spray water at about 60 degrees. This ensures a wider spraying pattern for better cleansing. Furthermore, the bottle is durable as well as It is made of a long-lasting rubber material. It is very soft as well so you can easily squeeze it. Embarrassed to carry it around? It can actually retract and reduce to half of its original size. This means that no one will even notice it because of its compact size. We found it perfect especially for females who often suffer bacterial growth and wish for something gentler! Hassle-free design and easy to use. Wider spraying pattern for better cleansing. 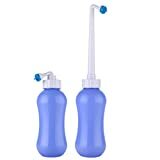 Durable and easy to squeeze bottle. Easy to control the spray pressures. Screwtop can be hard to screw. The Swytz Portable Travel bidet is perfect for those looking for a therapeutic experience, even on the go. The Swytz Portable Travel bidet is available in two bottle designs. However, you also have the option of buying both of them at a lesser price. The bottles are about 14.5 inches in length and 2.4 inches in diameter. This makes them very compact and easy to travel with. The capacity of these bottles is around 400 ml. This full-sized reservoir is suitable for most folks. It ensures thorough cleansing without needing to refill the bottle time and again. Also included are two long reach nozzles which can help you in more effective cleaning. The practical design ensures you always feel clean wherever you go! Did we mention the easily adjustable pressure? No more scrambling around with complicated electronics! You can easily get the desired pressure by pressing the bottle with your hands. What makes this bottle a true rockstar is perhaps the airlock technology. The metallic air valve ensures you can consistently squeeze and spray out water as it lets air in the back. The bottle is lightweight and durable as well. It can be stored quite easily as well. The dual pack is perfect for those who tend to travel a lot. It can help you eliminate the use of toilet paper from your life and get better, more hygienic cleansing. Compact and travel-friendly in size. Long, yet retractable nozzle for better aiming. Consistent sprays using the air valve. No need to refill the bottle after each use. Smaller capacity makes it harder for larger individuals to use. It tends to leak when placed on a surface. The OneRose Portable Bidet Sprayer is a one of a kind sprayer as it reduces the irritation often caused by toilet paper. It ensures a clean and hygienic toilet experience after each use. For those who can’t seem to part with their bidets, the OneRose portable bidet sprayer won’t even make you feel the difference. It effectively cleanses and helps you keep a high level of general hygiene. The long angled nozzle has about 6 holes which helps you cover a wider area. The jet of water can be easily controlled by your hands. The pressure of the jet stream is easily maneuvered by altering your pressure on the bottle. The 15.2 oz or the 450 ml reservoir ensures you never run out of the water while using it. It is perfect for cleaning solid waste as well without having to refill. The enhanced valve at the bottom of the bottle ensures a better control over the jet stream as well. What’s more is that the nozzle is retractable as well. The neck can be easily collapsed until it is only half of its original size. This means you can easily travel with it. Also included is a carrying case which helps you discretely carry it around without anyone being the wiser! The OneRose is the best travel bidet as it has a wide range of applications. It can be used in place of a shattaf, a Muslim shower and a bidet at home. Above all, it is quite affordable as well. The large reservoir which ensures you never run out of the water. Reduces irritation and delivers a gentle cleansing. The jet of water can be easily controlled. A carrying case is available as well. The nozzle is a little hard to collapse. The bottle is made of thin plastic/rubber. So, whether you’re looking for an inexpensive option to use in place of a regular bidet or an on-the-go portable bidet spray, any of our best travel bidets will serve you well. These portable bidets are small and compact in size, so they can be easily carried around. However, they are still large enough to help you get a thorough cleansing without needing any additional refills. Apart from that, they all are very easy to use as you need only fill them up and squeeze the bottle. In contrast, electronic and even manual bidets require you to go through extensive manuals in order to gain insights on how to operate them. 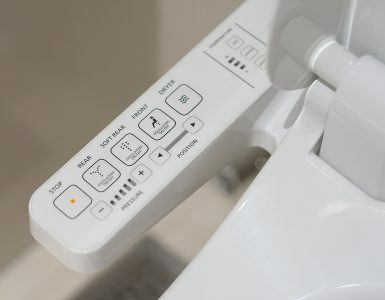 The portable bidet for the toilet is much easier to aim and much easier to operate. You can even control the pressure and the position of the spray as well! So, all you need to do is buy one of these and say goodbye to Toilet paper even in the public bathrooms!